Community Market and the Hubbub Club are happy to bring our post-HONK! celebration of local and touring street brass bands to SeBRASStopol! 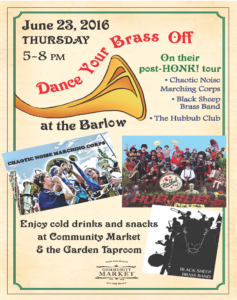 Meet us in the Barlow on Thursday, June 23rd, 5-8pm, for an evening of wild and joyful noise!